I wanna try this. Anyone else? Nice to see that year of highschool french finally paying off too. ps- sorry for the infrequent posting this week. I've got a music video shoot tomorrow and the next day that I'm styling, and then a surprise performance on saturday that we're rehearsing for non-stop. Living two parallel lives is complicated when things actually start happening. Not complaining, just stating. these are so cool!! how did you do it? So neat! I have never seen that before... I Love that you say "not complaining, just stating". Important difference! I always say that to my husband haha! 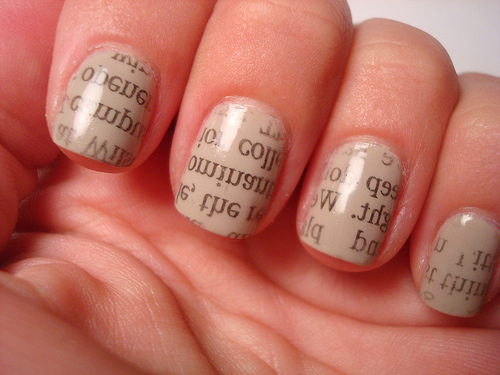 Probably have to wait until the top coat is almost dry and press the newspaper against it, wait 10 seconds and lift off. And then, apply another top coat.